Tips: Please use charger plugs from reliable brands, preferably the original ones that came with your device. Please do not charge your devices using Maitron cables when the power output is over 5V/2.4A. Super Compatibility: Precise interface design, iPhone X/ iPhone 8/8plus/SE/7/7Plus/6Plus / 6s Plus/ 6s /6/ 5s / 5c / 5, iPad Air / Air 2, iPad mini / mini 2 / mini 3, iPad (4th generation), iPod nano (7th generation) and iPod touch (5th generation). Compatible with all iOS11 devices. More choice: In daily environmental conditions, 3ft length for using in the car or desk working, it is appropriate length to save space and keep tidy; 6ft length for using on couch or bed, makes you easily operate your devices while charging. Fast Charge and Data Transfer: High purity and thicker copper wires make charging faster and stable, ensure a maximum charging speed up to 2.1A and good for cellphone's battery life. Sync and Charge at fast speeds on your devices. 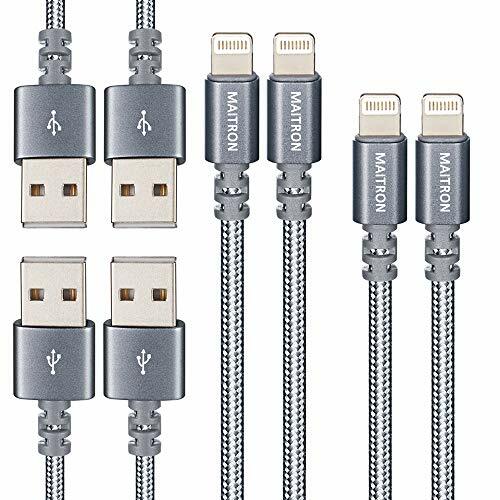 Nylon Braided: Different from traditional USB cable, sturdy and tangle-free design, covered with durable and premium Nylon Braided jacket which looks and feels great and trend colors optional. If you have any questions about this product by Maitron, contact us by completing and submitting the form below. If you are looking for a specif part number, please include it with your message.